Racing begins shortly after 7pm following a period of free practice. Drivers are randomly allocated heats, one in each of the four lanes. Heats are of 3 minutes in duration. Once the race is over, complete and part laps covered by each driver during this time is recorded, along with their fastest laps. The best 3 heats scores for each driver are added together and then sorted to decide the qualifying order for the finals. In the event of a tie, the total of the scores in all four lanes will be used. If that still results in a tie, the fastest lap in the heats will be used. The finals will be of three minute duration and raced with 3 automatic qualifiers (lane choice by order of qualification) and the winner of the lower final who hops up. In the event of an exceptionally large turnout where it looks like a meeting may not be concluded in reasonable time, at the discretion of attending members, heats for one or both classes may be reduced to 2 minutes in duration. This must be decided before qualifying for that class begins. The duration of finals may also be similarly reduced if necessary. In the event of an exceptionally low turnout making the running of finals with sufficient runners and marshals impossible, at the discretion of attending members, finals may not be run and points will be awarded for qualifying order. Alternatively finals may be run with fewer than 4 runners, with or without hop ups again at attending member’s discretion. This must be decided before qualifying for that class begins. Races where 3 cars de-slot in a mutual accident within the first lap of a race may be re-started at race control’s discretion. 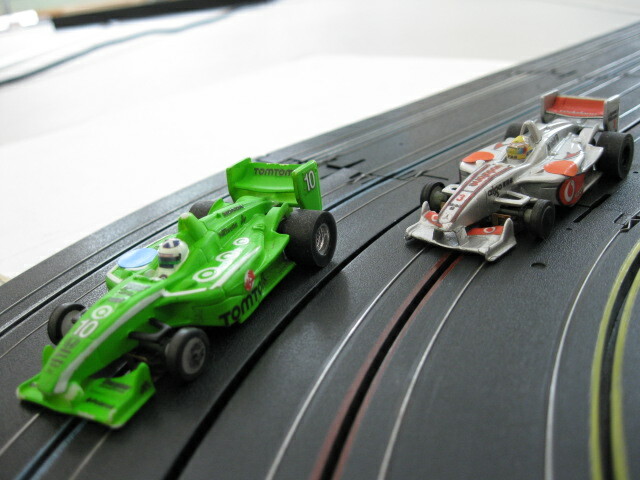 A race may be paused, by cutting the power to the track and by pausing the timing system. This is initiated by a call of “Track” by either a driver or marshal. Once the issue is resolved the race will be restarted. Our full club rules can be downloaded from here.